The human stupidity added to the unawareness of false protectionists that do not recognize the errors that others have previously committed, contrasting the introduction of possible remedies to alleviate the troubles caused, are often cause of damages to that nature which we care but that often we forget to love and we even try to mofidy. So it occurred that during the last century reckless naturalists thought to introduce foreign species in far away lands, with the purported aim of improving particular agricultural situations, to insert new species of wild game in order to increase the hunting presence, to find new foes to local species in uncontrollable excess or, even worse as now happens, because of that pretentious and fake love for the nature, to illegally give freedom to animals bred in captivity for economic purpose, in territories that see them then becoming species dangerously and irremediably infesting and harmful. A European example about this are the Nutria (Myocastor coypus) and the Wild boar (Sus scrofa) that stand among the 100 most harmful and invasive species in the world together with many insects, molluscs, fishes and plants; but to think that among these stand three small birds would appear really strange. The Common myna (Acridotheres tristis Linnaeus, 1766), order Passeriformes and family Sturnidae is one of these membres along with the Common starling (Sturnus vulgaris) and the Red-vented bulbul (Pycnonotus cafer). In Australia this starling has been classified as the “most important environmental problem for the country” with a so soaring growth rate to compromise irremediably the biological balance of this continent. For him they have even coined the nickname of “flying rat” having shown capacity of adapting and prevailing on the other species, similar to those evidenced by this rodent. Some decades ago were introduced in Australia one hundred of specimens of this starling for fighting the locusts that were infesting the cultivations of Queensland and in New South Wales but immediately they realized that their number was increasing dramatically leaving intact the number of the locusts. Now they talk of hundred of thousands of specimens in continuous increment and with constant enlargement of their diffusion area. As it happened for the rabbits and for the cats in that same country, as it was for the nutrias and the wild boars in Europe and as it happened for others species in other continents, it will be practically impossible to rectify this situation. The etymology of the scientific genus Acridotheres comes from the Greek “akris” = locust and “theres” = hunter, well identifying the feeding characteristics of this bird. The specific name tristis comes instead from the Latin and means sad, dark coloured, rightly for its livery. In the whole Indian subcontinent and in South-East Asia, the starlings and the graculas are currently called myna or mynah with derivation from the Sanskrit “mainā” = gay, joyful. Usually, this epithet is accompanied by a complement that classifies its species consequently we know the Common myna or Indian (Acridotheres tristis), the Collared myna (Acridotheres albocinctus), the Bank myna (Acridotheres ginginianus), the Jungle myna (Acridotheres fuscus), the famous Common hill myna or Indian grackle (Gracula religiosa), the Javan myna (Acridotheres javanicus), the Golden-crested myna (Ampeliceps coronatus), the Pale-bellied myna (Acridotheres cinereus) and many others. Being a bird now present all over the world, also because of birds escaped from amateurish nurseries, such nickname is often repeated also in the vulgar names given in places where they have been introduced. In English Common Myna; in German Hirtenmaina; in French Martin triste; in Spanish Miná Común and in Italian Storno triste and also Maina comune. 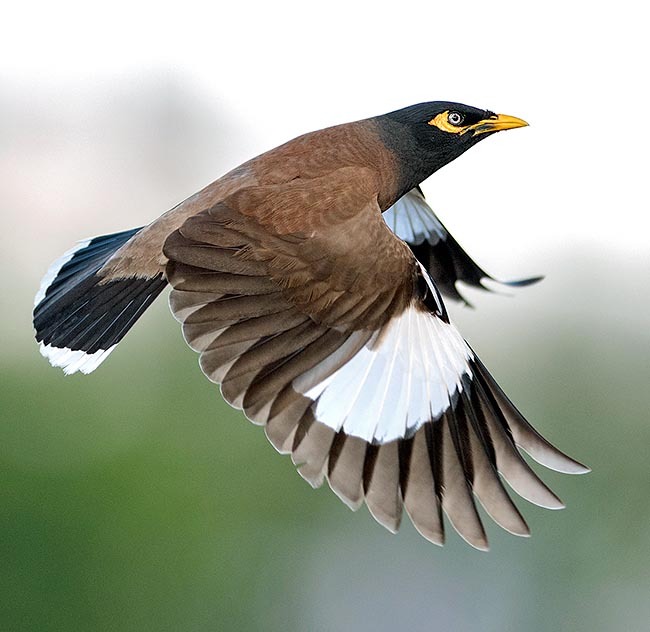 The Common myna is native to Asia and its traditional territory includes the belt going from Pakistan up to China, usually below the Himalayas. It is also found in some central Asian republics but only in the southern areas of their territory. Conversely, it is an introduced species, either deliberately or involuntarily escaped, in North America, in Middle East, in South Africa, in the biggest islands of the Indian Ocean, in Hawaii and in Oceania, even in the Fiji and Samoa islands. In Europe it has appeared occasionally and erratically in various Mediterranean areas and in some continental locations. It is considered as an invasive species and heavily spreading where introduced, as endowed of a high and innate capacity to adapt and conform to any situation and climate. Several subspecies have been identified among which two are the preminent ones: Acridotheres tristis melanosternus that, as its name states, has a darker livery typical to the south of India and Acridotheres tristis tristis in all other ranges. It lives from the sea level up to the 3000 m of altitude. The dimensions of this myna are those typical to the sturnids of all the world. They have a slender but compact body, are equipped with sufficiently ample wings as good flyers, have legs as excellent walkers and a robust multifunctional beak. It is an arboreal bird but loves very much to stay on the ground for most of the day. Has a length of about 23/25 cm, a wingspan of 30/35 cm and a weight varying from 100 to 140 g. The colour, as its scientific name states, is rather dark having the body of a dark brown grey colour, with jet-black wings, tail and neck. Only distinction of colour is the beak, the legs and the postocular spot of bare skin that are of a bright straw yellow colour, this last being one of the few characteristic to distinguish it from its congener Acridotheres ginginianus that, on the contrary, has it orange. On the primary remiges and the inferior coverts of the wings is present a wide white belt well evident when flying together with the final barring of the tail of the same colour, characteristics such as to transform it with surprise in a white black bird when flying contrary to the usual and gloomy livery when perched. There is no sexual dimorphism between the adults and the young have in the first months a more shabby without the evidence of the postocular featherless spot. Among the three biological rules governing the morphology of the species of warm-blooded animals in relation to the geographical zone inhabited, that is the size, the proportions and the colours, the common myna is one of the species involved in the Gloger’s rule that sees the colour of the livery becoming darker while gradually decreasing latitude in warmer and more humid climates. As a matter of fact, the specimens of south of India, and of Sri Lanka have a marked accentuation and darkening of the colour if compared with the conspecifcs living in the arid zones of northern plains of the Indian subcontinent. To talk of habitat specific for this bird is actually of little significance seen its capacity to adapt to any environment even if with characteristics absolutely different from each other. The common myna is nowadays at the same level of our Hooded crow (Corvus corone cornix) and of the Common blackbird (Turdus merula) that from birds once wild and reserved, have come to nest on the tree facing the balcony of our house, conquering territories that were previously unthinkable. This very abundant and social bird lives basically in open woods and cultivated plains, urban centres and public gardens, streets with motorized traffic and city dumps and it is not rare to see it rummaging outside the house in the flowerbed of our small courtyard. It lives also in orchards and in intensive specialized cultivations, where it had been initially introduced for the struggle against the insects but has modified its nutritional attitude finding new type of feeding with particular and palatable characteristics that have partially diverted it from its main aim, even leading it to cause damages to the same cultivations that had, on the contrary, to be protected. In fact, it does not disdain fruits, seeds, small reptilians and tiny rodents. It is very social among its similars as well as towards the human being that often besieges insistently around the benches looking for food or lefteovers, without ignoring a leap on the table of the restaurant left momentarily unwatched, to tak off some new delicacy. The myna is mainly insectivorous with preference for big winged or not insects, that looks for earnestly and assiduously on the soil in group, in its fast and continuous walking, with jumps and sudden chases when some prey is in sight. It usually follows also the grazing cattle so much to have deserved, in the Indochinese peninsula the nickname of buffalo guardian. The introduction of this locusts hunter has obtained more negative than positive results. It is in the same time very quarrelsome and aggressive with all other species of birds even if bigger. The high sociality with its similars is often used as means for mobbing crows, parrots, seagulls but also our doggy while walking in the park when it feels disturbed. Also with the man it does not show any awe and when cast from around, it moves of a very few metres without running away but emitting their clumsy song as for grievance. The myna is a very talkative bird and with various vocalisms often with tones next to the human voice and for this reason many use to keep it in cage as companion animal. However, usually it emits sounds not really pleasant such as croaks, grunts, squeaks and repeated whistles often boring and unbearable. Gathering then in enormous flocks in the early evening assemblage and in the roosting sites during the night, it causes such deafening buzzes to render unbearable the rest for those living close to these places. 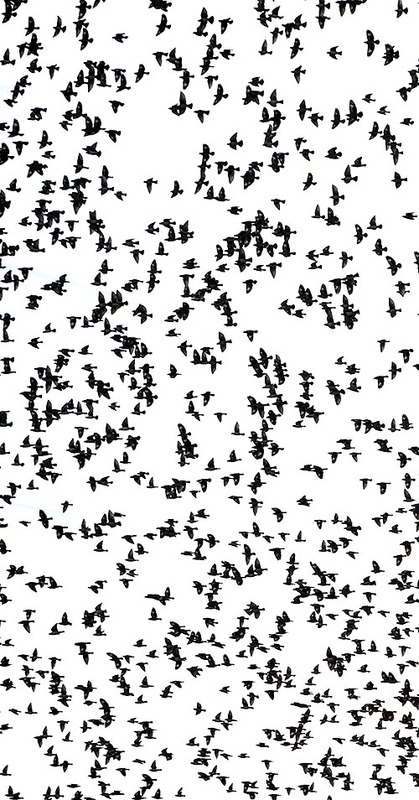 The habit of gathering in dense flocks in these prefixed locations to spend the night, is constant during the whole year also during the nidification period. The advent of this new intruder in the urban centres has caused and accentuated those typical damages that already pigeons and sparrows took in the past in the conquered cities. The construction of their nests in any unthinkable hole and the intake of considerable quantities of material as well as urban waste such as paper and plastic, invariably causes damage to drains and strainers that are obstructed but also to chimneys and tiles resulting in the impairment of the isolation of the building. Furthermore, the conquest of a territory has strongly disturbed the presence of other species of birds present in these areas since thousands of years. In Australia, various arboreal parrots particularly the so much loved Galah and Corella (Cacatua spp.) that nidify in the hollows of the trees, are practically evicted without fear, as well as all those species nidifying in small holes in the urban dwellings, occupying systematically every possible cave and affecting the reproductive success of the native species. Not only, it has been noted that this bird often empties the nests already occupied by other species, robbing eggs and possible chicks. A real fiend that causes unsustainable damage. 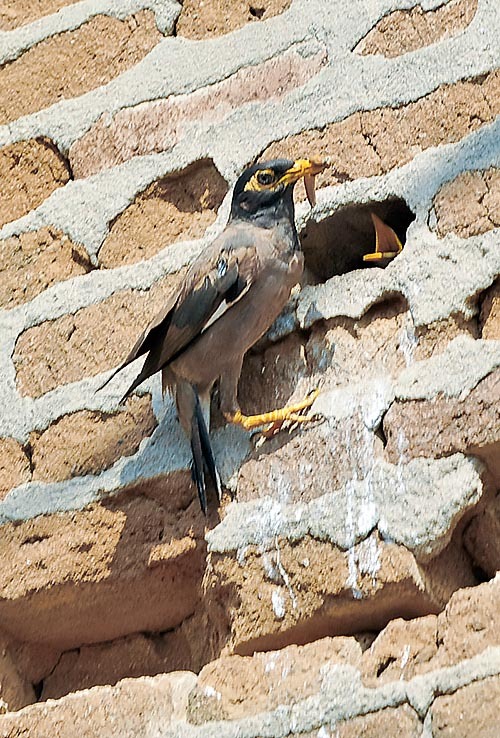 It is thought that the myna is monogamous till the death of one of the partners and this marital assiduity gives excellent results in their reproductive cycle. As mentioned before, it nidifies wherever possible taking the most different materials for furnishing the recess where it will deposit its usual 5 (4 to 6) turquoise blue eggs. It does not have a specific period for the nidification and this varies from place to place depending on the latitudes, availability of food and weather conditions. The brooding lasts about 18 days mainly done by the female and the chicks, that come to life featherless, stay in the nest for 3 weeks more. 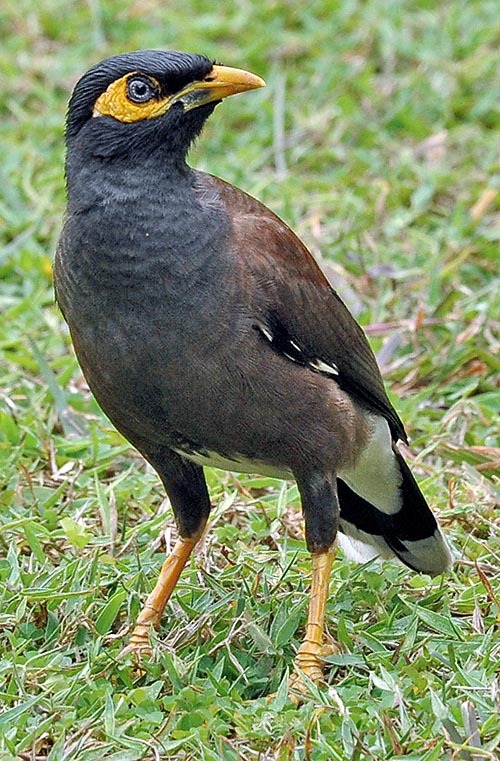 In West India are known cases of parasitism against this myna done by the Koel (Eudynamys scolopacea) a common Asian cuculid that lays its eggs in the nest of other birds. Though the populations of this bird are everywehere in continuous increase, so much to be considered as an invasive species, in some areas, on the contrary, it is in marked reduction due to the fact of the presence of other sturnids, also introduced, that prevail in the conquest of the territory. 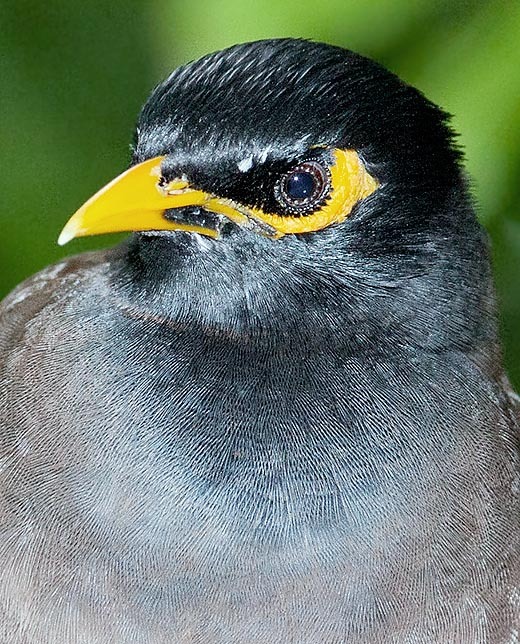 This is the case of Malaysia and Singapore, where the Acridotheres tristis is opposed by the presence of the Javan myna (Acridotheres javanicus). In the old Sanskrit culture this bird had various identifications that actually reflected characteristics well visible even today. Seen its incessant chattering, it was considered as the archetype of a polemical person that had many things to say. In effect still now along the Indian roads, its squeaky song is probably the only sound capable at times to prevail on the deafening noise of the daily life of this population. Finally, it seems that the Indian myna is carrier of a bacillus of infections harmful for other birds and also even for the human being. In some Pacific Ocean islands where it has been introduced, they have noted that this bird is carrier of fleas and lice.